Welcome to Troop 186 ! Three Bridges Boy Scout Troop 186 is chartered by the Three Bridges Reformed Church and has been serving Youth and the community since 1949. We meet at the Three Bridges Reformed Church located on Main Street in Three Bridges on Tuesdays during the school year from 7:00-8:30 pm. Troop 186 belongs to the Hunterdon Arrowwood District of the Washington Crossing Council. For information, email information@readington186.mytroop.us or use our Contact Page from the menu. Despite the rain, the 2019 Bike and Hike event was fun for all. 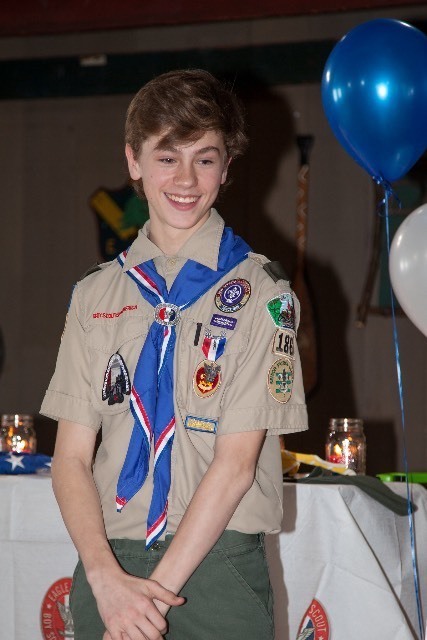 Congratulations to Scott Grimes on earning Eagle Rank. 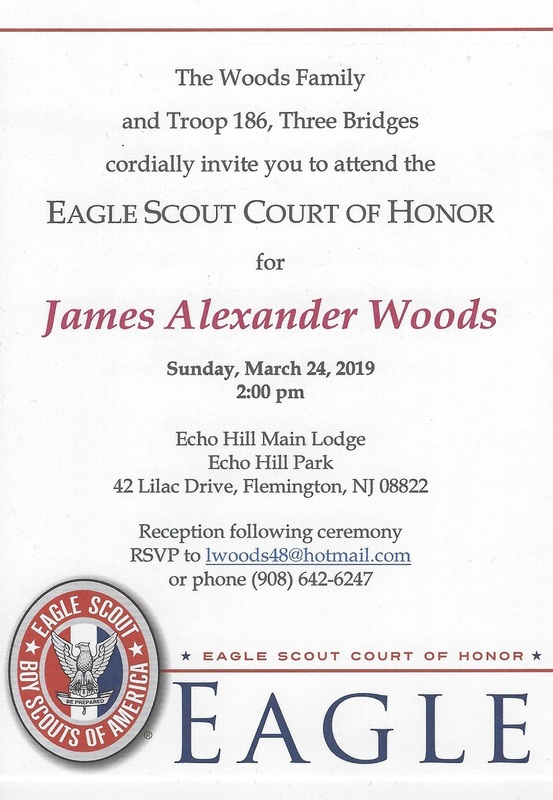 Check out more pictures of his Court of Honor at https://readington186.mytroop.us/image/tid/1095. 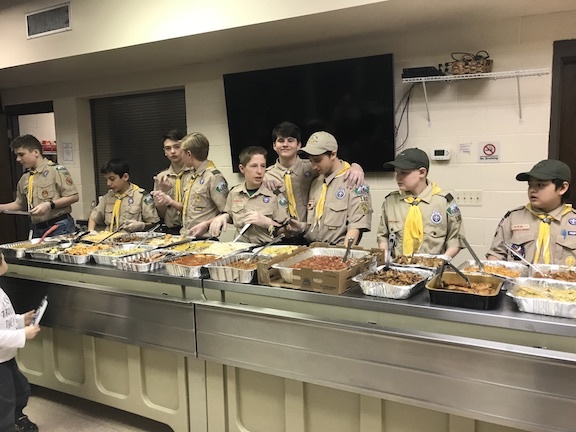 9 of our scouts served dinner at Shepherd's Meal in March. What a great way to do a good turn and earn service hours. Check out more pictures in the photo album (https://readington186.mytroop.us/image/tid/1092). Please come to our meeting on 5/1/19 at 8:00pm at the Benson's house at 10 Metler Way, Flemington. Registered and prospective scouts are welcome!! The Philmont 2020 trek dates have been announced and our crews have been assigned July 7 - July 19. As of now, there are 7 openings left that can be filled by 1-2 additional adults and 5-6 scouts. We have a cabin reserved for the weekend of Jan 11-13 at Ockanickon. We will prepare for the Klondike and hike. We will also have a cookoff if there are sufficient numbers, Please register so we can establish a head count. Payment of $35 is due Tuesday Jan 9 at our Troop meeting. Please bring a check payable to Troop 186. Grubmaster will be assigned.